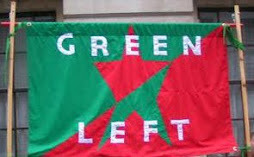 Green Left has been launched as a network for socialists and other radicals in the Green Party of England and Wales. It will act as an outreach body that will communicate the party’s radical policies to socialists and other anti-capitalists outside the party. Green Left (GL) is based on the assumption that capitalism is a system that wrecks the planet and promotes war. A green society must be based on economic, political and social justice. GL in short works to promote ecosocialism as a solution to our planetary ills. GL supports the democratic structures in the party and encourages transparency, accountability and engagement in all organs of the party. We also see the Green Party as a ‘bottom up’ political organisation where the principles of the membership are paramount and not a ‘top down’ one where a self-designated political elite decide on policies and principles. GL aims to increase and improve the international links of the Green Party, building links with radical greens and ecosocialists across the planet. It will work closely with members of other European Green Parties to reform the workings of the European Green Party structures that must be democratised. Green politics must realise the slogan ‘think globally, act locally’ by linking practical local campaigns to global issues of ecology, democracy, justice and liberation. GL aims to act within the Green Party so as to raise Green Party politics to meet the demands of its radical policies. Green politics needs to be based on dynamic campaigning and hard intellectual groundwork to create workable alternatives. GL aims to build regional campaigns and contribute to coalition-building through coherent alignments and open discussion with progressive anti-capitalists. The movement that is required to address the issues across Britain, Europe and the world will not be the sole preserve of one party. The movement requires the development of united action by progressive forces including organisations formed by working people to defend their interests in the workplace. Within this diverse movement GL will stand firmly in favour of the libertarian and democratic traditions of ecosocialism. It is vitally important that the Green Party works to develop the continuing peace, environmental and social movements. An orientation to organised working people through the Green Party Trade Union Group (GPTU) also requires maximum support from GL, with the emphasis on supporting radical and rank and file currents in the unions. Likewise, GL should seek to promote organisation and solidarity amongst currently unorganised and marginalised groups. GL will work to enhance Green Party contributions to demonstrations, marches and other solidarity events. Greens must be active on issues that affect ordinary working people in their everyday lives and aim to be known as amongst their strongest defenders. While GL is keen to build links with members of faith communities, and to fight alongside them against intolerance and discrimination, it will not compromise on human rights – including issues concerning women, the lesbian, gay, bisexual and transgender communities, and people with disabilities. Since the activism of William Morris in the Social Democratic Federation and Socialist League in the late nineteenth century, there has been an ecosocialist tradition in Britain. Green Left believes that ecosocialism provides an alternative to a society based on alienation, economic exploitation, corporate rule, ecological destruction and wars. Our analysis demands that in the best tradition of the historic left we ‘agitate, educate and organise’ to build such an alternative. The time has come for drawing together forces that can present a serious challenge to the disastrous neo-liberal project. We believe that ‘another world is possible’, based on ecological and socialist values. In conclusion, Green Left would work to enable you to live in a society based on peace, ecological balance, economic equality and inclusion. Come and join us!